When a client comes to me with a problem related to the sale of a horse, a trial period, a lease, or similar and I ask to see the contract...and there isn't one. Prevailing in a "he says" "she says" situation can be very difficult because everyone tends to remember past events with the filter of their own motivations. However brief, make it a priority to have something in writing, signed by the parties, that represents your agreement (and covers your potential liabilities). When someone provides a contract to the other party, and allows the horse to leave the premises before the contract is signed and returned. 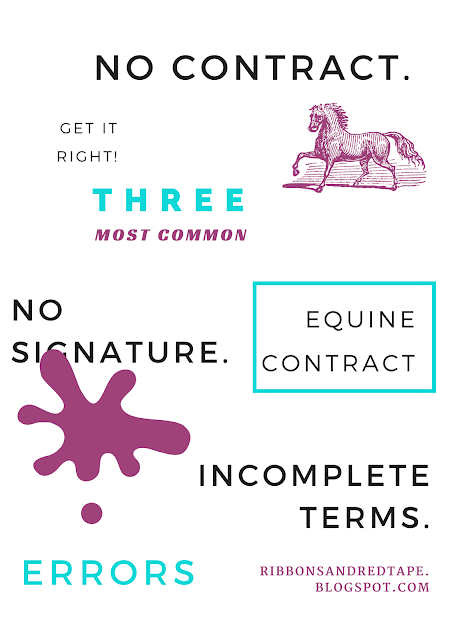 While the person who took the horse is possibly "on notice" of the terms of the arrangement, the signature represents that the person agrees to be bound by the terms. If someone leasing a horse receives a contract dictating he or she must pay for the horse's rehab for 30 days in the event of lameness, but then doesn't sign the contract, the owner of the horse most likely cannot compel the Lessee to act in accordance with the terms of the contract. In the horse world things often happen quickly or with agents (such as a trainer picking up a horse), but stand firm and get the signature first. When a client comes to me with an equine issue that is not accounted for in the contract. For example, the parties may have used a Bill of Sale but not a Purchase and Sale Agreement. If the owner made warranties or promises when he sold you a horse, but those are not included in the documentation, then you will likely have a difficult time proving your case. The best situation is to review your contracts with an equine attorney to make sure they are appropriately broad, as well as appropriately specific, for your situation. Or, if you are provided with a contract by the other party and you wish to add terms, include them on a contract and have both parties date and sign the addition. In any contract situation consider what is material, particularly the terms related to money, dates, and what to do if something goes wrong. It is those material provisions that, at a minimum, should be in your contract. Lesson to be learned: Use a contract that is complete and correct for your specific, particular situation; provide it to the other party and receive a signature before you take any further action related to the horse deal. Equine Architecture: is your barn safe?